Brockenhurst Mill was located, not surprisingly, on Mill Lane - the B3055, close to where the Lymington River passes under a road bridge, beside the 'T' junction opposite the entrance to the Whitley Ridge Hotel. Brockenhurst Mill is shown by Isaac Taylor in 1759 on the first detailed map of Hampshire; whilst Henry Comyn, in his 1817 Boldre and Brockenhurst directory, shows John and Elizabeth Dodd as residents, living with Elizabeth’s sister, 11 year old Maria Neathway; and servants John Perkins and Anne Burroughs. Brockenhurst Mill was an undershot corn mill, powered by a leat and pond fed by the adjacent Lymington River. It was owned in 1817 by the Morant family of nearby Brockenhurst Park. 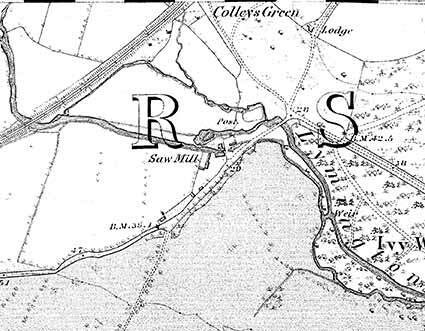 By the 1870 Ordnance Survey map, however, a ‘saw mill’ is marked on the site, whilst the 1910 Ordnance Survey map simply shows the word ‘mill’. According to Water and Windmills in Hampshire and the Isle of Wight, published by Southampton University Industrial Archaeology Group: ‘The mill and mill house were both demolished sometime after 1964, leaving the wheel-pit, mill races and sluice. An embanked stream supplied the water power. The present house has been built on the site’. Hampshire Treasures, published between 1979 and 1986 by Hampshire County Council, suggests that the present building dates from the 19th century, and notes that the mill housing was then in poor repair. Today, as a reminder of the old mill, two moss-encrusted mill-stones are displayed on the lawn at the front of the house, beside a channel of water that probably was originally associated with the mill’s operation.